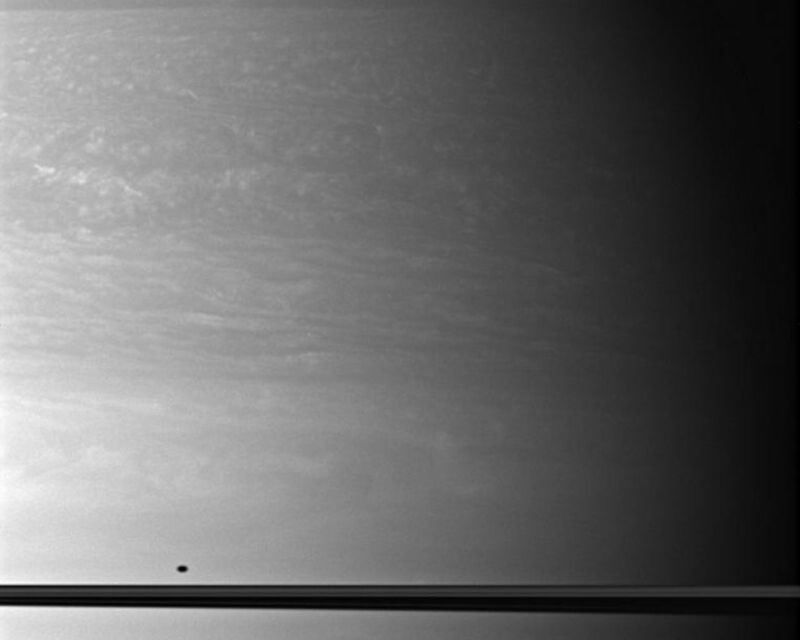 The shadows of two moons appear on Saturn, above and below the plane of the planet's rings. 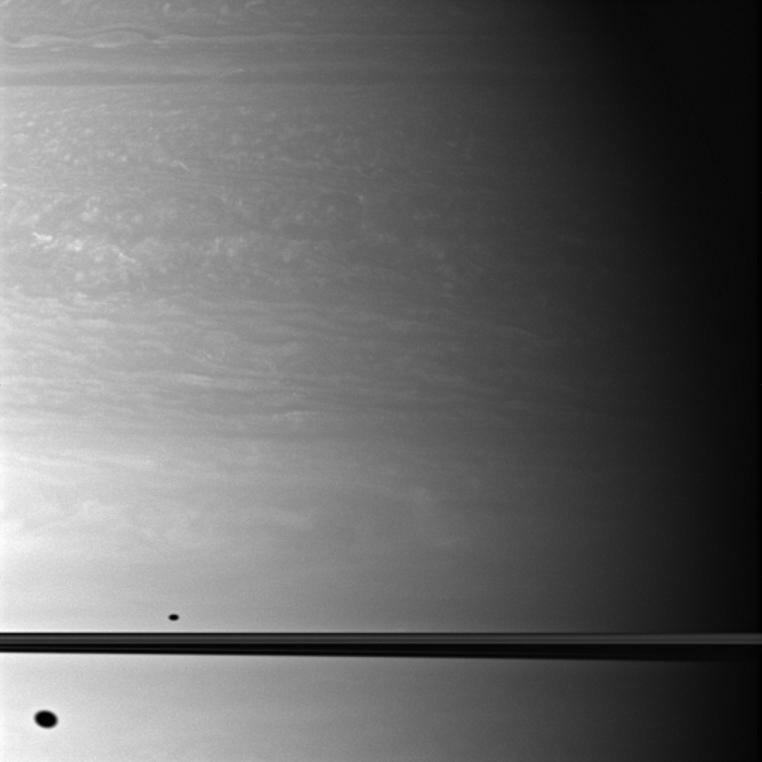 North on Saturn is up in this image, and the shadow of Dione (1,123 kilometers, or 698 miles across) can be seen south of the planet's equator. 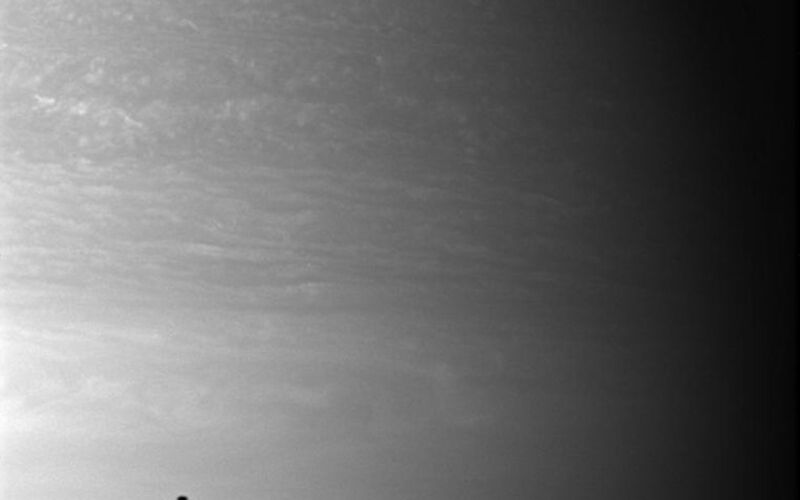 The smaller shadow of Mimas (396 kilometers, or 246 miles across) is north of the equator. Dione and Mimas both have orbits that are slightly inclined in relation to the planet's equatorial plane, so, depending upon the orientation of their orbits, their shadows may appear north or south of Saturn's equator. The moons themselves do not appear in this image. This view looks toward the northern, sunlit side of the rings from about 1 degree above the ringplane. Scale in the original image was 100 kilometers (62 miles) per pixel. The image has been magnified by a factor of 1.5 and contrast-enhanced to aid visibility. The image was taken with the Cassini spacecraft wide-angle camera on Oct. 15, 2009 using a spectral filter sensitive to wavelengths of near-infrared light centered at 752 nanometers. The view was acquired at a distance of approximately 899,000 kilometers (558,000 miles) from Saturn and at a Sun-Saturn-spacecraft, or phase, angle of 65 degrees.